When's the Best Time to Visit Gatlinburg? Hop over to Gatlinburg in spring when vibrant blossoms bloom, sweet springs stir, and wondrous wildlife awakens. The weather is perfect for hiking adventures in the national park, where breezes keep you cool and new sights, smells, and sounds await round every turn. Better yet, roll down your car windows and take a leisurely drive through the gorgeous valley area of Cades Cove; this 11-mile loop takes you past flowering fields, historic structures, and grazing white-tailed deer. Or meander through Vista Gardens, which features spectacular mountain views, an adorable gnome village, children’s play area, and more surprises at Anakeesta (an ace aerial adventure park). Plus, you’ll enjoy songbird serenades as you sip morning coffee. Dive into Gatlinburg this summer when lush greenery flourishes, sparkling rivers rush, and playful bear cubs come out to play! Spend warm days outdoors, rafting down the Little Pigeon River via the Nantahala Outdoor Center or fly fishing, cycling, horseback riding, or swimming in the national park. Summertime is also a great time for moonshine at the most-visited distillery in the country at Ole Smoky Moonshine Holler. Or perhaps, wine sampling is more your taste, best experienced at the Smoky Mountain Winery. And don’t forget to grab fresh ingredients from the Gatlinburg Farmers Market before cooking out for the party at your cabin with a private pool! Fall in love with Gatlinburg when the mountain air is crisp and the leaves change to sunflower yellow, brick red, sunset orange, and eggplant purple. Ride a glass elevator 407 feet to the top of the Gatlinburg Space Needle for a bird’s eye view of the breathtaking fall foliage all around the city. Next, get your October spook on at the Mysterious Mansion, where ghoulish fiends dwell in the shadows…After terrifying thrills and spine-tingling chills, tour around the Great Smoky Arts & Crafts Community for locally crafted souvenirs or attend one of the many festivals held during this beautiful season. And end each day with s’mores and ghost stories round the firepit at your cabin rental. Hurry into Gatlinburg this winter when snow flurries and falls, waterfalls become nature’s glistening ice sculptures, and the mountains sleep with a soul-soothing silence. Twinkling light displays adorn the city, with mesmerizing trolley tours at night. During the day, stay warm indoors at museums, arcades, and shopping centers. Stroll under the sea at Ripley’s Aquarium of the Smokies, beat all the high scores at Fanny Farkle’s, and shop for Christmas décor, toys, and trinkets at Santa’s Claus-et (the largest Christmas store in town!). Or opt for snowy fun outdoors by skiing, snowboarding, and tubing at Ober Gatlinburg (plus, there’s a year-round ice rink inside). It’s also the perfect season for romantic cuddles by the fireplace or family movie nights in your cabin’s home theater. 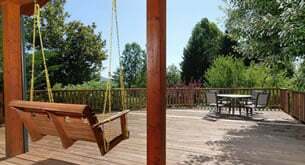 Whether the best time to visit Gatlinburg for you is in spring, summer, fall, or winter, a comfortable place to stay will probably come at the top of your vacation plans. From romantic 1-bedroom cabins to 3-bedroom family retreats to 16-bedroom lodges, Cabins for YOU has plenty of cabin rental options in and around Gatlinburg, TN. Plus, we offer tons of amenities, including fully loaded game rooms, private indoor pools, home theaters, king-size beds, FREE Wi-Fi, fully equipped kitchens, and mountain, wooded, river, or city views. Get ready to make lasting memories with family, friends, coworkers, and teammates at your cabin in the Smokies! Spring, summer, fall, and winter each provide a unique Gatlinburg experience. The best time to visit Gatlinburg is the season that suits YOU.